WAIST HIGH: Furry Creatures News. 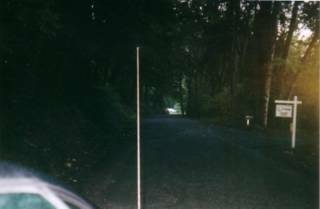 The above photograph is the road leading to the place of employment of your favorite Blogger. Dark, scary, and smack dab in the middle of Oregon Bigfoot Territory. "Austria -- -- Police have caught a man in a gorilla suit who was terrorizing elderly hikers by leaping out of bushes at them near the towns of St. Margarethen, Rust, and Oggau. He said the place was so boring he wanted to give people something to talk about." "Canada -- -- The town of Creston, B.C. has decided against putting up a bronze statue of Bigfoot carrying a CASE OF BEER."